The next card in our journey through the Major Arcana is The Hierophant! The Hierophant is often represented in the form of a Pope or other religious-leader figure, with Tarot Mucha’s stern, red-clad image serving as no exception. The Hierophant card usually depicts three figures: the larger Hierophant presiding over two smaller figures, as representation of human “attempts to mediate between the opposing poles of life and find some way, not to resolve them, but simply to hold them in balance. A religious doctrine, with its moral codes and explanations for life’s most basic questions, does just that. If we surrender ourselves to a Church the contradictions of life all become answered; but not resolved” (Pollack 57). Corinne Kenner describes The Hierophant as “the card of time-honored values and beliefs” (45), and its appearance in a spread often indicates a need for examining your spiritual values in some way. I love Lunea Weatherstone’s offer that this card represents “comfort through confession and absolution” (Weatherstone 16). I read in this that spiritual healing can occur on any interrelational level through honest communication and forgiveness! The Mythic Tarot represents The Hierophant as Chiron, the Wounded Healer. Chiron was the healer of the gods, and after being granted immortality was pricked by one of Hercules’ poisoned spears. While the wound would kill any mortal, Chiron lived, and gained new levels of understanding towards the plight of those who are injured or in pain. Sharman-Burke and Greene describe Chiron as “the one who through his own pain can understand and appreciate the pain of others and can therefore see further and higher than those who are merely blindly content” (Sharman-Burke and Greene 34-35). Kenner beautifully describes the way that “the role of the hierophant lives on in every spiritual teacher and guide who leads followers through seasons of hope and experience” (Kenner 45). This is echoed by Weatherstone, who offers that “[a] true spiritual teacher will inspire self-forgiveness and a fresh start, free of the guilt and shame of the past” (Weatherstone 16). While the Hierophant can represent dogmatic control and authority, at root this is a figure of teaching and spiritual healing. The Feng Shui Tarot’s Hierophant is a solitary monk, sitting on a mountain peak, eyes open to the present. Rachel Pollack notes that “[o]ur democratic age rejects the notions of an intermediary between the individual and God” (54). The Feng Shui Tarot’s monk represents the individual ability to meditate and find the correct answers deep within – almost a direct representation of Pollack’s interpretation of The Hierophant reversed: “forming original ideas” (57). In the Little White Book accompanying the FST deck, Eileen Connolly writes for The Hierophant’s Core Aspect Reversed: “[y]our sense of freedom and expression should not be limited” (10). I always smile when I see The Hierophant reversed, because it makes me think of having the divine personal power to start marching to the beat of your own drum! This the a card about Spirituality, Religion, and Tradition, as well as societal institutions and group support. Religion, or spiritual practice, provides “a firm tradition in which [a person can] root his or her personal development…[t]hus we see religion as an experience” (Pollack 56). Religion as experience allows personal perceptions to be valid universal insights, when combined with meditation and assessment of personal values. The Hierophant represents meeting that part of the Self “which can begin to formulate and express a personal philosophy, an individual vision of the spirit, which guides” (Sharman-Burke and Greene 35). 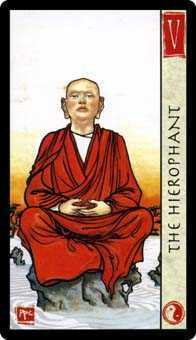 The Hierophant’s astrological correspondence is Taurus. The two share the same type of energy: “practical and reliable, patient and persevering. It’s feminine and receptive: it provides fertile soil for growth and development” (Kenner 46). Having a solid foundation for your code of values and ethics is a springboard for productive personal development, and this can be found through religion, self-help, education, or whatever makes the individual feel they are being fed spiritually! The past few weeks have been nuts for me, and whenever I’m down, naturally I start perusing Amazon to look at new decks, books, etc! 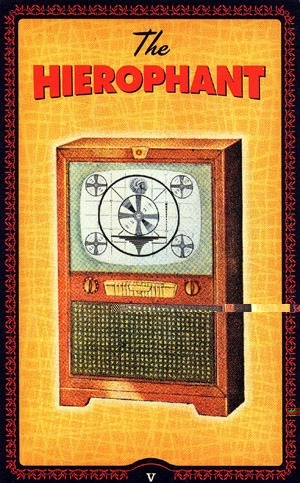 I was having a hard time getting down to writing this post, but when I came across The Housewives Tarot’s version of The Hierophant as a Television, I knew I had the final piece of my post’s puzzle! On the one hand, the TV (or the Screen in its many contemporary forms) can be seen to represent the aspect of The Hierophant embodying “conformity…surrender of responsibility…[and] our own inner sense of obedience” (Pollack 57). However, with the rise of Google and the endless founts of information to be found on the information, much of it now incredibly relevant and helpful when searched through the right filters, Screens can be sources of higher wisdom indeed, especially in times of spiritual need. My personal image of The Hierophant ties in to my Unitarian Universalist upbringing, as I was picturing the stained glass in the Halifax UU Church when I was sketching! I added the classic symbol of the Hierophant: the silver and gold keys. A minister sits on the same level as her two congregants, whose heads are bowed. The rest of the seats are empty, perhaps because ethics is a spiritual counseling sessions, or perhaps because the effects of secularism and the search for individual spirituality has emptied the physical churches in our society. At any rate, The Hierophant is happy to provide light and guidance to those who need help finding peace! Sharman-Burke, Juliet and Liz Greene. The Mythic Tarot: A New Approach to the Tarot Cards.Cards illustrated by Tricia Newell. Toronto, ON: Stoddart Publishing Co. Ltd, 1988.